Patch is a ship's cat who lives aboard The Golden Earring. Along with her friends, Cutlass the parrot and Monty the monkey, Patch frequently gets the pirate crew out of trouble - although they never realize quite how much she does to save their skins . . . 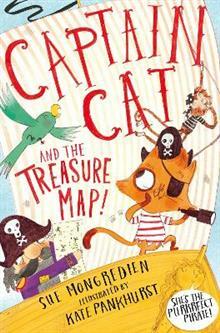 In their first adventure, the pirate crew discover a treasure map and set out to find where X marks the spot. But little do they know that the the treasure is cursed and it's up up to Captain Cat to stop them, before its too late! A fully illustrated laugh-out-loud piratical adventure for newly confident readers or to enjoy together, from Sue Mongredien. Sue Mongredien has had over one hundred children's books published, including the Oliver Moon and Secret Mermaid series for Usborne, and the Prince Jake books for Orchard. She is also one of the authors behind the internationally bestselling Rainbow Magic series, as Daisy Meadows. Kate Pankhurst has a studio based in an old spinning mill where she writes and illustrates children's books. Recent projects have included the Fantastically Great Women series and Mariella Mystery Investigates series. Kate is distantly related to the suffragette Emmeline Pankhurst, which has been an influence on the type of books she enjoys creating.